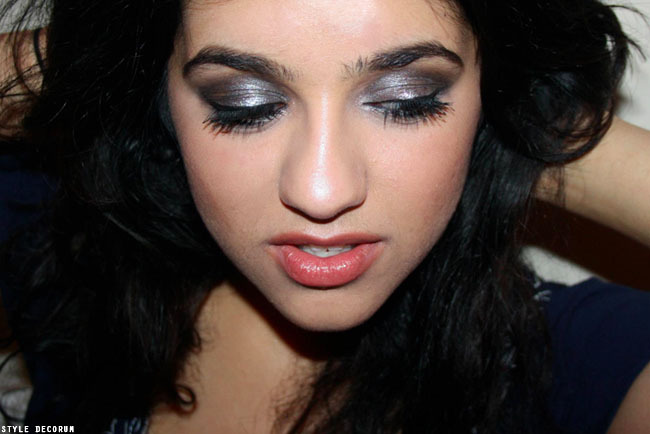 For this look I used urban decay’s gumetal (from the trusty Naked I palette) with a black in the crease and simply finished off by adding the silver glitter eyeliner in the center of the lid. This is so much more hassle free than using ACTUAL silver glitter, which by the time you’ve used it will look like Tinkerbelle threw up all over your room. So I highly suggest you invest in some of this stuff. The one that I used was from Shu Umera. I have to say that the staying power on this is phenomenal. It will last ALL night with no risk of it seeping all over your face. The only downsides are the price and the somewhat ‘crusty’ feel on your eyelid. I don’t mind the sensation but I can see how some people might. Plus, grabbing this in the summer sale for a mere £3 means that no harm was done to my poor wallet! I love your blog and I love your style. I´m fan! !